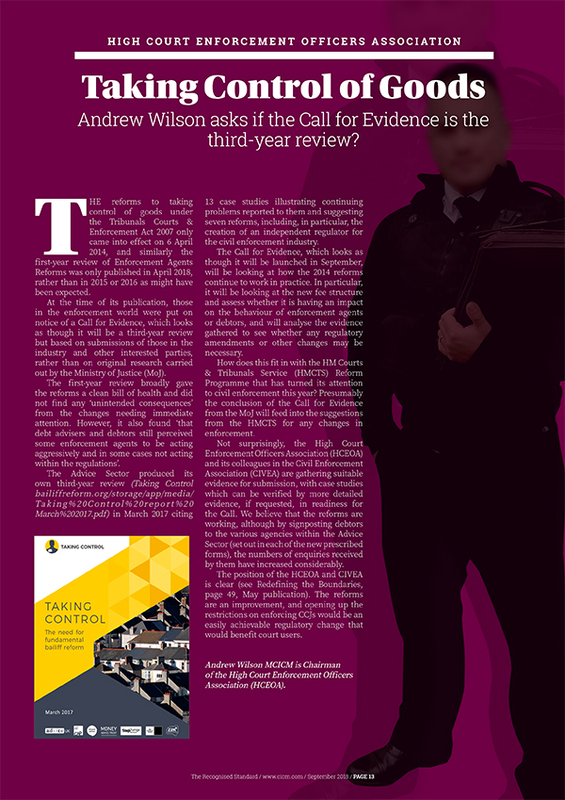 In his role as Chairman of the High Court Enforcement Officers Association (HCEOA), Andrew writes about Taking Control of Goods and anticipates the third review of enforcement agent (bailiff) reforms introduced in 2014. The industry has been on notice of a Call for Evidence. This will examine how the reforms continue to work in practice, looking at areas such as fee structure as well as the impact on the behaviour of agents and debtors. Evidence gathered will be analysed to ascertain whether any regulatory amendments or other changes are necessary. You can read Andrew's full article here. At Andrew Wilson & Co we take compliance and the professional conduct of our agents very seriously. All attendances are documented and we review cases daily.